1.This image appears in the rareDestructio sive eradicatio totius arboris Porphirii : magni philosophi ac sacrae theologiae doctoris eximii Augustini Anchonitani ordinis fratrum Heremitarum Sancti Augustini, cũ quadã decretali eiusde, published in 1503. At first I though that this pamphlet was going to led us into a way-of-thinking, or sensibility, about aboriginal non-technical people thinking and relating mechanical and technical ideas. I also thought it might relate in some way to the absence of the advanced Chinese civilization in the 17-19th centuries (for example) of drawing technical ideas in a standardized fashion, in perspective, which I thought was so well done in the West and which helped lead to the great scientific and industrial revolutions to come. It relates to neither, but it does in a way tell us the story of an American Indian artist from the 1880's responding to outside influences in the Navajo world. Choh's face was disfigured by an incident when an infant, though as a young man of 22 or 23 in 1886 "he (was) by no means a stupid clown we would take him to be". In my experience of paying attention to unusual found-art found in unusual places, I have paid particular attention to found-art in the sciences that have full lives out-of-context of their text. [See the series Unintentional Absurdist.] And so while reading through an issue of Die Naturwissenschaften (1931) for an article by Herman Weyl ("Geometrie und Physik") I found in its closing pages a review by Arnold Berliner of R.W. Pohl's Einfuhrung in die Physik--complete with these three fantastic silhouette illustrations. They're simply beautiful things, exceptionally designed, simplistic but detailed and dramatic and way beyond what was necessary to illustrate the intended physical principle. It is a nice and unexpected artistic find. Johannes Gutenberg just couldn't last long enough to enjoy his vision. His venture--or at least his end of it--went bust after his business partner filed for teh return of his investment, and Gutenberg, not having the cash and with proceeds from the sale of his bible being slower than expected (and so on), was forced to pay off the debt with his business. He certainly got a lot of things right, and his vision was sound and accurate, but his financial planning was just not there. He need some more money-room, as the introduction of movable type printing did not take off as quickly as he would have liked. (THis is true even though it was widely recognized as a major achievement--it was just somewhat slow in taking footholds elsewhere.) Plus, the Gutenberg Bible was an expensive thing, equal to the yearly wages of a skilled mason--had he invested more effort (and paper) into publishing more popular titles, he may have been much better off, and wouldn't in the end wind up losing most everything, and broke. Anyway, Gutenberg to me is a different case because he got almost everything correct, except for timing the money. I found this unusual heading in a half-page ad in March 1864 issue of American Agriculturalist for the Farm, Garden, and Homestead--as it can well be imagined it stopped me pretty quickly, if for no other reason than to make certain that the heading was correct. And it was. The seed manufacturer, James Vick (from Rochester NY) in the midst and throes of other oddness reprinted a letter from a correspondent named George Ford, who was writing from Lawrence, Kansas, about his experience in that town in 1863, and Quantrell, and (maybe bu tmaybe not) Vick's flowers. Capt William Clarke Quantrell--a sociopath who led a group of avengers and bushwhackers and various sorts of murderers and guerrillas in service of the Confederacy--was in Lawrence in 1863 committing acts of vengeance and murder against its citizens. Mr. Ford expressed his admiration for Vick's seeds and how lovely they were, and that they were responsible for saving his house from destruction by Quantrell. It is a remarkable thing to include in ad advert for flower seeds, closing in on the end of the war--it is also the only mention of the war for this issue and one of the few acknowledgements of it in this entire year. Quantrell eventually pissed almost all of his men off, winding up with a dozen die-hards, and then in Kentucky and dead in June 1865, ironically and mortally wounded in a Union ambush. At the end of WWII there was a tale of two battles, both by the name of Kolberg. One was a propaganda tool filmed in Agfacolor at the demand of Josef Goebbels, a movie begun in 1944 about the mythically-endowed victory of Germany over Napoleon at Kolberg. It was an epic, costly movie made at a time when the 180,000 "extras" composed of Wehrmacht troops could not be spared, but it was seen by Hitler and whoever was around to agree with him that a movie selling selflessness and sacrifice (blood sacrifice) was more valuable than a military victory1. When it was finally put to bed, the movie "opened" virtually nowhere in Berlin in January 1945, as the city was becoming a bombed-away shambles--much more so in the next three month. The visions of resistance-to-the-last-breath played in few places outside of Hitler's bunker, where the dictator professed the qualities of sacrifice and the fight-to-the-death messages in the movie, though not applying those necessaries to himself. The other Kolberg battle was the Battle of Kolberg (a Baltic seaport city in Pomeria located about halfway between Berlin and Koenigsberg), which took place in real life from 4-18 March 1945. It was a fight between the Germans and combined forces of the Soviet and Polish armies--it ended in Polish hands on the 18th following the retreat of the Germans and he destruction of most of the city. It is ironic that the defeat of the Nazi forces in the real city of Kolberg occurred at nearly the same time as the wasteful film of the 1807 battle extolling the virtues of heroism and sacrifice was released. It is interesting too that the actor depicting the leading German hero in the movie Kolberg (directed Veit Harlan and Wolfgang Liebeneiner) Heinrich George--who acted in a number of Nazi propaganda films after finding ways to get back into favor following his pre-Nazi pro-Communist politics--found himself arrested and imprisoned in Sachsenhausen concentration camp, where he died of "complications" in 1946. Sachsenhausen was one of the longest-lived concentration camps, being in operation from 1936 to 1950. From its beginning to May 1945 it was of course a Nazi concentration camp (Konzentrationslager Sachsenhausen), where from 1943 until the fall of Nazi Germany it was also an extermination camp. As many as 200,000 people were seized and sent through Sachsenhausen and its satellite/tributary camps. From the end of 1945 to 1950 it was operated by the Soviet Union, where another 15,000-30,000 people were imprisoned, Heinrich George being one of them. In addition to the many horrors of Sachsenhausen, there was also this--it was the center of a plot to destroy the British economy with the production and distribution of a hundred million pounds worth of counterfeit British currency. The lead counterfeiter at Sachsenhausen, Salomon Smolianoff (a gifted artist who once said "why make art when you can make money?") was an inmate with exceptional skills and who basically headed the team of workers responsible for this effort, For good work in his part of pulling down the economy of Great Britain, Smolianoff was rewarded with an occasional go at a ping pong table, as well as less-rancid pieces of meat. This was operation Bernhard, named for its director, SS Major Bernhard Kruger (the leader of the VI F 4a Unit in theReichssicherheitshauptamt (Reich Main Security Office) or RSHA), who was responsible for the operation from 1942, and which eventually extended from Sachsenhausen to other camps, most notably a major operation at Auschwitz. More than 134,000,000 pounds of what the Brits considered to be the most perfect counterfeits ever were produced, but for various reasons--not the least of which was sabotage instigated by extraordinarily brave concentration camp internees--the vast part of the plan was never implemented. As it turns out, Smolianoff survived Sachsenhausen, survived the war, and then became a puff of smoke. He was a wanted-but-not-found fugitive, and spent his last days in Brazil, painting. And creating toys. He died in 1976. Bernhard Kruger (born in 1904), also survived the war. When the pound-forging plan was scuttled in 1944, he moved the idea over to American currency, which he worked on until the end of the wat. Although he was kept by the British for two years, and then by teh French for one year, he was eventually released, and faced no charges until a Denazification court ordered him to trial, where he was somehow acquitted. He died an old man, aged 85, in 1989, in his bed. 1. At least this is so as reported by Sir Ian Kershaw in his biography, Hitler, 1936-1945. I found this sub-magnificent collection of Police-Sponsored Anti-Crime Bunko-Squad pamphlets in a collection of other material from long ago that today looks so mundanely sublime. They were published by the Boston Better Business Bureau, and listed an alphabet or thereabouts of small- (and not-so) time grifters and frauds and what-have-you who were set to produce ill among the good folks of Beantown, and how to recognize and avoid them. (The reports are all in the same format, printed via offset on 11x8.5 inch sheets, titled in pencil "Pamphlets on Fraudulent Business Methods and Schemes" and printed in 1936.) There are 34 in all, stapled sheets at left-top, each about 10pp long (making for about 350 leaves), with each having an example of a conversation between the consumer and the grifter. These schemes have a colorful flavor, and some sort of antique pleasantness to them, except that they were all based on fraud and deceit. The schemes include numerous out-and-out bait-and-switch approaches: Bait Window Advertising Scheme, Free Permanent Wave Scheme, Smuggled Goods Scheme, Bait Advertising Scheme, Business Opportunity Scheme, the Re-load Scheme, A Switch and Sell Scheme, Bucket Shop Scheme, Tipster Sheet Scheme, Sewing Machine Scheme, Memorial Park Cemetery Scheme, Heir Scheme, Bait Advertising Scheme, Song Writing Scheme, Is It Bait? Bait Scheme, Action Sale Scheme, Stuffed Plate Scheme, Stuffed Flats (Furs) Scheme, Buy Wholesale Scheme, Insurance Association Scheme, Partner-Wanted Scheme, Long Distance Tailoring Scheme, Bait Advertising (T.C. System) Scheme, Free Lot Scheme, Home Work Scheme, Furniture Club Lottery Scheme, Charity Merchandise Scheme, Suit Club Scheme, Picture Enlargement Scheme, Puff Sheet Scheme, Territorial Rights Scheme, Obesity Cure Scheme, Territorial Rights Scheme, Cash Bond Scheme, Unordered Merchandise Scheme. Schemes enough for one and all, and all with a flavor of Mony Python's Spam routine. This is the start of what I hope to be a useful page of interesting and useful texts and timeline/chronological links for the history of mathematics. I'll be adding to this over time. It is interesting to think about the newness of old things, particularly English words that we have in use every day. In this case I'm referring to words in the sciences--and not necessarily the words coming in the 20th century following the explosion of modernity beginning in 1895. It is surprising sometimes to realize the relative newness of some terms, like, for example, "scientist". The word "science" is very old and very old in English, but the word "scientist" is coined only in 1833. It is surprising to think of the modernity of some of the words when by their constant use they seem as though they must be ancient, but of course are not so. This post was written five yers ago when I was excited to find an illustration of a dreamer and numbers with some mathematical content. I thought that it was pretty unusual to find as an illsutrastion, even though I had read many stories of people being influenced byt their dreams, evem in the sciences, but that there were few images of the process. In Post 692 I psoted a found image of such a thing that was just a simple advertisement in a German magazine. 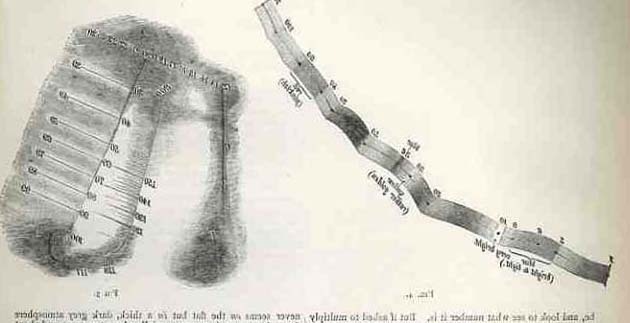 There was also a series of images from Francis Galton on imaging arithmetical processes from Nature back in 1880, which may also be the first scientific article on synesthesia. And there doesn't seem to be a lot more than this, even in canonical illustration. Paul McCartney1 dreamed the song Yesterday, Gandhi dreamed the source of non-violent resistance, Elias Howe dreamed of the construction of the first sewing machine, and Mary Shelley the creation of her novel Frankenstein... For good or for ill, William Blake was evidently deeply influenced by his own dreams; on the other hand, Rene Magritte was deeply influenced by dreams but didn’t use any of his own for his paintings, or so it was said. Otto Loewi turned an old problem into not one in a dream, finding a solution to the prickish problem of whether nerve impulses were chemical or electrical (and resulting in the Nobel for medicine in 1935); the fabulous discovery of the benzene ring came to August Kekule in a dream as well. Artists have been representing people in dreams and dreamscapes for many centuries: Durer depicted a dream in a 1525 watercolor, for example, and thousands of artists have depicted famous biblical dreams (Joseph of Pharo) for long expanses of time. I always thought that the word "scientist" came to us from William Whewell in his Philosophy of the Inductive Sciences (volume 1, page 113) in 1840, the group of people dedicated intrepid seekers of standards and anomalies finally receiving a short and concise (if three-syllable) name for what it is they are (for even in death a scientist is still a scientist, no past tense there, like a Marine): once one, always one. "We need very much a name to describe a cultivator of science in general. I should incline to call him a Scientist." "Leonardo was mentally a seeker after truth—a scientist; Coreggio was an assertor of truth—an artist." --1840 Blackwood's Magazine, volume 49, page 273. The War Production Board (WPB)--the entity responsible for printing the leaflets below--was instituted 16 January 1942 as a federal effort to direct U.S. wartime production and allocation of essential commodities. And time. The WPB centralized the effort to convert some peacetime industry to wartime production, as well as direct the production of existing wartime industries in the manufacture of critical goods, and rationed or prohibited the manufacture of other material that could possibly hinder the war effort. Thus the WPB rationed things like sugar, heating oil, plastic, gasoline, paper, rubber, nylon and metals of all descriptions; it also controlled large swaths of the workforce, restricting wages and benefits as well as prices. It was an essential element of fighting the war, and brought necessary control to an economy and industrial base that needed organization for what would become a total war.